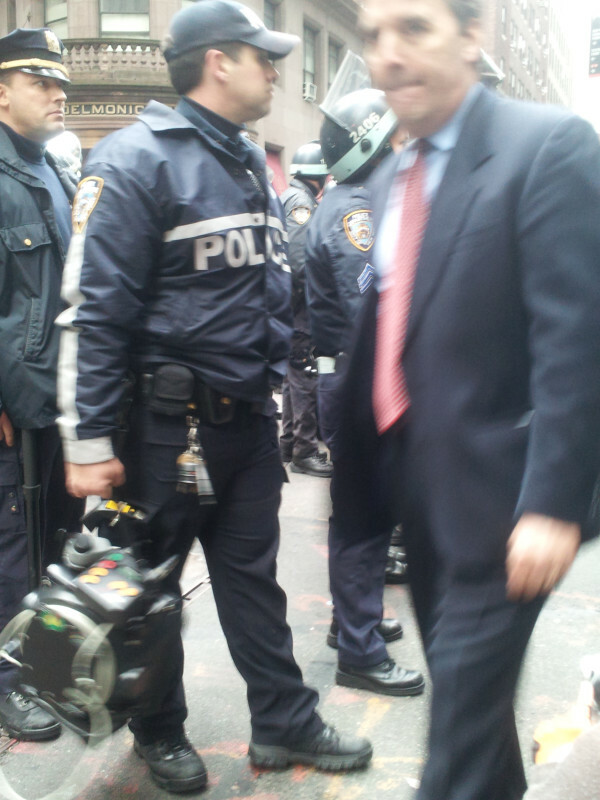 What is that thing this NYPD officer is carrying today? TPM says it's reported to be a Long Range Acoustic device, aka LRAD. The American Civil Liberties Union of Pennsylvania filed a federal lawsuit today on behalf of Karen Piper, a bystander who suffered permanent hearing loss after Pittsburgh police deployed a Long Range Acoustic Device (LRAD) against protestors during the 2009 G-20 Summit. An LRAD emits harmful, pain-inducing sounds over long distances. Developed for use by the military, LRAD technology had never before been used against US civilians. "Police departments should not be using weapons built for the military on civilian protesters," said Witold Walczak, legal director of the ACLU of Pennsylvania "As this case shows, the LRAD cannot be controlled to prevent serious harm to innocent bystanders. Collateral harm to innocents may be justifiable in wartime, but not to quell protesters who overturned a couple of trash dumpsters." On September 24, 2009, Piper, then a visiting professor at Carnegie Mellon University, decided to observe G-20 protests in Pittsburgh's Lawrenceville neighborhood as research for her book on globalization issues and the responses of bodies like the G-20 to protest activity. She arrived at Arsenal Park around 10 a.m. and saw protestors calmly and peacefully milling around the area. After the protest began, Piper walked on the sidewalk a short distance from the marching protesters, in the company of other curiosity seekers and journalists. When Piper became concerned about rapidly increasing police activity, she tried to leave the area. As she was walking away, police officers activated, suddenly and without warning, an LRAD a short distance away from her. It emitted a continuous piercing sound lasting several minutes. Piper immediately suffered intense pain as mucus discharged from her ear. She became nauseous and dizzy and developed a severe headache. Since then, Piper has suffered from tinnitus (ringing of the ears), barotrauma, left ear pain and fluid drainage, dizziness, and nausea. She still suffers from permanent nerve damage. "The intensity of being hit at close range by a high-pitched sound blast designed to deter pirate boats and terrorists at least a quarter mile away is indescribable. The sound vibrates through you and causes pain throughout your body, not only in the ears. I thought I might die," said Piper, now an English professor at the University of Missouri. "It is shocking that the LRAD device is being promoted for use on American citizens and the general public." According to the lawsuit, there was insufficient risk of harm to the police officers or public safety to justify use of the weapon, and law enforcement had adequate time to warn those in the area about activation of the LRAD but did not do so. In the lawsuit, the ACLU-PA argues that the city of Pittsburgh and individual police officers violated Piper's constitutional right to peacefully assemble. The suit also alleges that city officials' decision to use a weapon that they knew could cause severe and permanent injury to bystanders was unjustified and violated Piper's due process rights. The LRAD, a distance hailing and crowd control device, was originally developed in response to the terrorist attack on the USS Cole in October 2000 and was intended to be used by American warships to warn incoming vessels approaching without permission. Among other things, it emits harmful, pain-inducing sounds over long distances. According to Walczak, local ear doctors reported that they treated a fair number of people, including Pittsburgh police officers, for hearing and other ear problems in the wake of the LRAD deployment. The ACLU-PA will use the discovery process to learn more about the extent of the harms caused by the LRAD, to police and others. Yet another pain compliance device in use against American citizens. The good news is that the intense pain it causes anyone in the vicinity is "harmless." Except when it causes permanent damage. I suppose everyone is different. I think I can handle pepper spray as hideous as it sounds. (Maybe not. I've been lucky enough not to have it happen to me.) Being tasered sounds horrifying. But this weapon would be unbearable to me with my sensitive ears. In fact, it would be torture. Which is what all this "pain compliance" technology really is. If you stand right next to it for several minutes, you could have hearing damage," he said. "But it's your choice." See? You have a choice. You can just not protest. If you do, expect torture and possible permanent damage. That's what being free is all about. FYI via TPM: The Occupy Wall Street tech working group has created a live-updating, crowdsourced map,#OccupyMap, that pulls in Tweets, videos, emails and other reports submitted to the website from those on the ground in Manhattan. To submit your own reports on Twitter, use the hashtag #occupymap and include location information (street intersection).